Across industries, as never before, AI has not only become big business, but is now encroaching steadily in analytic-centric jobs. More and more business and consumer applications are using the same services for search, social, purchasing and analytics. 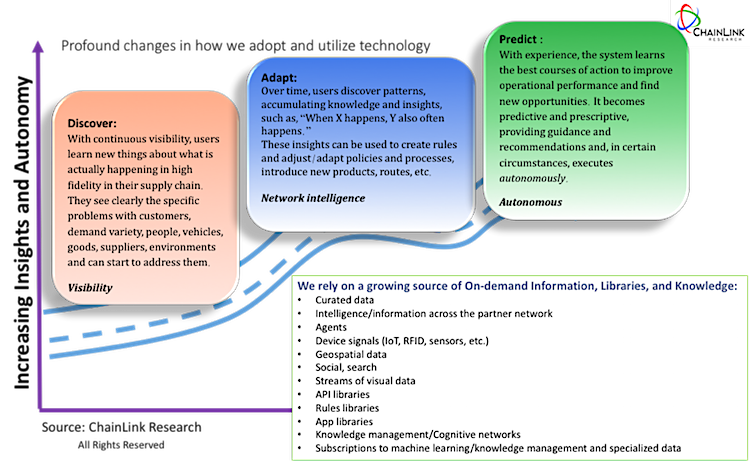 Using this information as a source, machine learning will change the face of supply chain--the information we use, the technology we use, and the conclusions we reach. This will have huge implications for work as we know it. In this report we explore the implication of AI/Machine learning on the supply chain planner. In the first installment of Thinking Machines, we looked at some overall issues of AI. We learned that inanimate things can learn.1 And as AI developers pursue what it means to be human, demonstrations of “conversations” are beginning to make their debuts so that machines can interact naturally with people.2 We then took a brief, but dark, look at some macro-societal/-economic factors in the Gilded Age and then made some observations about the career path that Demand Planners can take. In this segment we will explore the future of planning and planning systems, not from a technical perspective as much as from a career perspective, and what opportunities and challenges are confronting us. Our long-term goal in robotics is to design learning algorithms to allow robots to operate in messy, real-world environments and to quickly acquire new skills and capabilities via learning, rather than the carefully-controlled conditions and the small set of hand-programmed tasks that characterize today’s robots. One thrust of our research is on developing techniques for physical robots to use their own experience and those of other robots to build new skills and capabilities, pooling the shared experiences in order to learn collectively. More and more business and consumer applications are using the same services for search, social, purchasing, and analytics.3 This will have huge implications for work as we know it in the coming decades as software developers, robotics developers, hyper-scale companies, and big-data providers blend their collective intelligence. Across industries, as never before, AI has not only become big business, but is now encroaching steadily in analytic-centric jobs. One example is Financial Services, an industry with a huge population of staff that is in “customer advisory” capacities, explaining and selling complex financial products4 with many choices for customers based on a myriad of fit criteria: customer goals, risk factors, product mix in a portfolio, etc. that feed into decision making. From the mundane opening of a bank account to accessing credit, to investment decisions, this is serious stuff. We are already accustomed to a myriad of web products to access credit and make investments, and to the point, we are witnessing the disappearance of customer-facing roles. Large analytical efforts by internal IT organizations, tech companies, and hyper-scales like Google and Amazon have led to the creation of and continued addition to their psychographic customer profiles, which include social and personal data, as well as financial history. Other industries such as retail, public transportation, real estate, and so on are deploying more and more sensors, mobile tracking, video, and other devices to collect data about consumers and their movements. People’s lack of ability to shield their identity confers the ability to triangulate many of these data sources and, ultimately, gain real insights into groups and individuals. And that has huge implications for our immediate topic—supply chain planners. Oddly, supply chain planning, which is so reliant—or should be—on understanding customers, has not done much, yet, to tap into many of these data sources to develop a clearer picture of their markets. Going beyond the statistical or predictive analytics that many companies are focused on mastering, the new AI software attempts to identify discrete groups and individuals and get at the intrinsic motivations of consumers’ feelings and taste to determine a thing’s desirability.5 And that is key as we examine how AI might begin to take on a greater role in the supply-chain office of the future. With a little vision, then, we can create the kind of functions and job roles that will be required for a new kind of demand plan—and planner. We want to be able to glean trends and, possibly, actual demands based on customers’ tendencies, and match them to desirable products, features, and experiences to create products that delight. We can create responsive supply chains that really serve the customer. However, it will not just require different software than we used to run the supply chain in the past, but different people. And those people will change the structure of organizations. They will have greater influence on the services and products of tomorrow than their predecessors did. I talked to Bill Panak, VP of Data Science at Halo Business Intelligence;8 Karin Bursa, Executive Vice President of Marketing at Logility;9 several people from ToolsGroup, including Pat Smith, Managing Director of the US for ToolsGroup ;10 Harve Light, President of Churchill Systems;11 several people within Infor GT Nexus and One Network; and George Fowler, Group Vice President of Spinnaker’s supply chain business unit12 to name of few people and companies, about the issues of adoption and the changing roles within the enterprise. I like to think of these as trusted knowledge networks. They use B2B integrations, shared business data, and Machine Learning with sensing which is pulling and absorbing the relevant data in any format, from any source. This data is analyzed and the system learns from decisions and outcomes as it interacts with the users. And importantly, it also learns from the observable universe, constantly getting smarter. Agents and other automated methods execute and may, ultimately, provide an autonomous environment. Why would I trust a system rather than my own skill, I wondered? Nacho Ochoa, Global Director of Product Management at ToolsGroup, provided one answer in a sample scenario. “A cosmetic company we work with experienced an uptick in demand. The usual suspects—price, season, and so on—were already embedded in the traditional planning systems and were consistent with expectations. There had to be something else. Through social sensing we identified a blogger—with high social influence—who was prominently featuring the product on her page. This drove the spike in demand.” Think about what a progressive company can now do with that information that they could not do before! You see, there are potentially thousands of events—beyond your sight and your enterprise data systems—that occur that can impact demand or supply. Weather, port slowdowns, traffic and travel delays, big events in a location, influencers, competitors, and so many more that impact demand beyond the traditional key variables in supply chain systems. Organizations without visibility and insights into these causals will continue to make mistakes. Statistics vary, but about 80% of the events that impact your plans, according to Ochoa, are outside the data you collect today. And, of course, you are not going to pay a bank of workers just to sit and search and sift every minute to find these events, understand their impact, then determine the right action for each and every product at each and every demand point. There is so much data to manage. But autonomous seems a big leap. Look, then, at this scenario.13 A dramatic case is Costa Express,14 which manages 9000 demand points with one planner! And these are not long tail, but daily—and sometimes by the minute—demands that need to be fulfilled. “The software has assumed much of the detailed tasks of analyzing data and inventory replenishment.” As all fast food customers know, demand is dynamic. There are many regulars who show up at the same time for their coffee, but the majority of patrons are quite unpredictable. Events around the demand point can change significantly, increasing or decreasing demand. Costa Express’s demand points include air and train terminals, their own coffee bars, convenience stores, partner servers, and vending machines that all need to serve fresh and high-quality coffee. Demand can be a simple replenishment list for a fixed machine or a complex order with hundreds of variable-quantity items for their coffee bars.15 That is a huge amount of data for one individual to process without some really smart software backing them up. How is our base of customers changing and why? What are economic and social factors that are driving our customer to—or away—from us? Based on our core, where are the unserved needs of current customers? If we modify/evolve our current products, what needed market can we serve? How do we define our customer in more precise and meaningful ways? Our supply chain—what new innovations in materials, supply, and/or labor sources can we explore? What are the risks in sources that we need to be aware of? Competitor innovations? What are they doing in terms of product, service, supply chain, pricing and so on? What events are happening or are going to happen that will impact demand or put supply at risk? How much do we want to rely on the software to learn, present answers, and automate the answers into execution using our own employees? How much do we want to rely on 3rd parties to assume tasks and how many of those tasks will they do? As Karin Bursa pointed out, “Trust is critical.” Of course, we are not talking about autonomous weapons where life and death and decisions of international import may be done.16 But for your company, a poor choice can still have important consequences. Without trust, customers are not going to buy and take the time to implement the new technology. Without trust, users will not use the information or “answers” coming from the system. Trust cannot coexist with fear. Will management install more powerful software and I will lose my job? So far the data says no, since, today, supply chain is experiencing a talent gap. Costa Express is one of the stars that grew without adding headcount, rather than confronting layoffs. In fact, it’s the ambition to do more with more data and discovery that is driving enthusiasm among workers within the company. And that is one of the keys—the ambition of people to think more and “ask different questions,” says Bill Planak of Halo/Logility. As Halo works with customers on new projects, in the short run, the users are focused on ease of use and learning the new systems. That unto itself has been and is still a big hurdle. But if a software company can address that, they will have opened the door to a longer term vendor/customer relationship and more profoundly, “trust,” as Karin Bursa says. That trust allows for a transition, I learned from Bill, because users do know over time the system will assume more tasks while they learn to do things they could not do before. Bill does admit that some of those new questions may be asked by new or different people. So that is either a threat or an opportunity for future planners. Managers may become more engaged with planning as information opens more possibilities. That positive leadership can encourage planners to exercise their creativity and discovery skills. It is a different story for BIC (who we featured in another article), who are implementing some autonomous/demand planning as a service. Though they have no plans to lay off—they say they have a challenge hiring and retaining. Once their new system is implemented, of course, there will be fewer job openings in the future planning department. It all reminds me of an old movie, with Spencer Tracey and Katherine Hepburn, called Desk Set.17 Hepburn manages the “research department” (ironically, her character’s last name is Watson) and a team of researchers. Tracey is the “efficiency expert” bringing in the new computer which will replace the department. In this saga, the humanWatson beats the computer, but today’s Watson is besting people. The fact, as we have stated, is that the scale and scope of market dynamics is just too large now for people to comprehend it all. That is, they need, consume, and process lots of data. But as they learn, they produce more clarity over time. Karin Bursa pointed out that the majority of systems today are more “what if” oriented, giving the users three or four options. 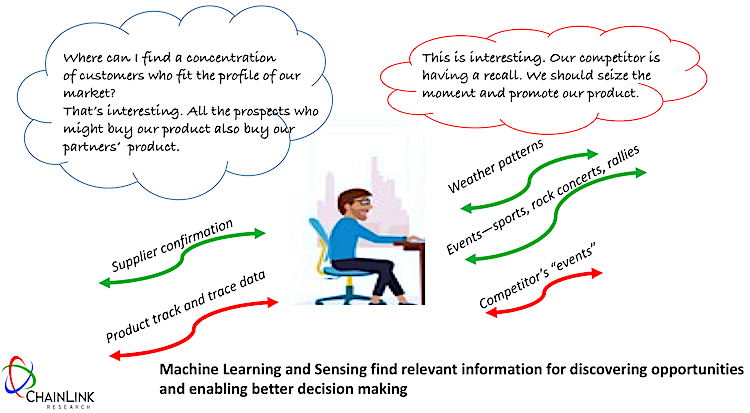 Machine learning, over time, will analyze hundreds of scenarios and deliver the “best solution” to the user. Again, that takes lots of data and lots of learning, but already we have organizations and applications where these systems are in use. And they are amassing more data and more results, refining the machine learning intelligence. The organizational issues most intrigued me. As Bill pointed out, there will be an evolution in who is diving in, exploring, and utilizing data. Way back when, we used to have “management sciences.” In those days, they were considered a somewhat erudite group of analytical types who would work on more advanced questions. However, today and in the future, the so-called data scientists will be embedded within the functional areas, since demand planning is considered an analytical role. The software applications that serve them have embedded big data interpretation, AI/Machine Learning and other analytical tools. Acquiring new types of data, recognizing its value, knowing how to use it and how to catalyze more advanced thinking in your organization takes initiative on the part of planners and their management. 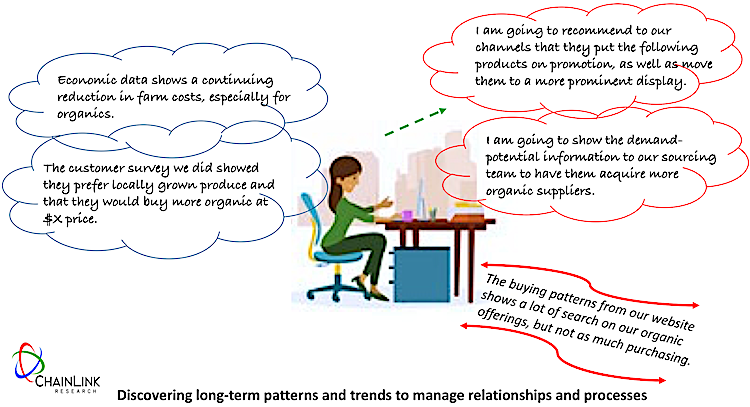 Rather than cranking out fixed reports, planners can engage in discovering patterns and trends. Planners become data experts, and they discover many new types and sources of data: for instance, organizations that source and supply data and can manage huge databases across a range of topics and hold years’ worth of data. Planners will need to educate others on what these sources of data tell us and why the investment in discovery time is worth it. And most powerfully, they will be able to leverage others’ discoveries. The open source world, such as the R analytics world, has been at this for years.19 Also, your favorite supply chain tech providers have rich and growing libraries of agents, analytics, sensors (search and filter of data), IoT integrations, B2B integrations, and so much more, which are most relevant by persona or role. Bill Panak points out that the planners will have to be schooled to some extent to learn about and find these new sources of data—what/where they are, what the data means, how to use it, and how to modify existing systems or learn new ones to analyze complex data to uncover the gems. Though planners of the future won’t do statistical forecasting, they’ll still need to understand it. Knowledge of statistical forecasting models, which will be created by the Machine Learning engine. Ability to interpret a variety of metrics and their relevancy. Product, commodity and market expertise. Know the market from demand thru supply. Knowledge of data analytics methods/techniques. Cross-functional collaboration and expertise to understand requirements of information flows to and from other organizations within and outside the enterprise. Communication skills. The ability to interpret and communicate “the numbers”—but more importantly, the exceptions and their impacts—to senior managers. Decision-making skills. Going beyond being just a reporter of demand information or creating forecasts, planners, armed with their thinking machines, will be entrusted and empowered to decide courses of action based on the insights they have. Economics—predictive methods to understand the overall, long-term picture. Data scientist—understand fuzzy data, big data and data sources such as social; temporal sources from crowdsourcing, mapping, weather, mobile and so on. Understand and leverage sensor/senses data. Pursuit and integration of demand streams from data sources such as IoT and home digital assistants. Most of the planners with this training are not available today in the work pool, so that, again, provides the opportunity for existing staff to grow. Because of factors such as this, Bill pointed out that change will be incremental. And that means more automation. Dynamic pricing can be automated to drive demand. And demand shaping by a computer/AI system that pushes those “you might like” products in front of the consumer is very much the norm. Planning has to keep up with all these moving targets! Harve Light also pointed out that schools are not minting graduates with this knowledge—not in business, nor in supply chain. And what is being taught in the AI/engineering and computer science schools is the generalization of how to create models. Those graduates move into IT or tech companies and not generally into the end-user planning departments, which may look a bit dated to the younger workers. Panak says that the new people are breaking down barriers. And Light says organizations need broader thinkers. This all sounds very exciting. Surely, smart ambitious professionals would want to be in that supply chain environment. What the Job Might Look Like? In the future, planners will be purveyors and curators of information and will be responsible for understanding the broader view. Today’s planning processes are often disjointed: marketing, finance, supply chain, and engineering/design may each have their own unique view of product planning, often with little real insight into the end-customer. The Machine Learning platforms, on the other hand, are often designed to pull from rich sources, uncover relevant bits of information, evaluate patterns, and collectively gauge results to create a cycle of learning. Of course, enterprises will have to implement these systems differently than they did in the past to operate in this broader context. Harve Light has a point of view that is central to the changing role of the planner. “I have a strong faith in human beings. I believe the planner role will have an additional important responsibility. In addition to understanding their world in more depth, planners will also have a continuing operational role, but at a more strategic level, e.g. setting objectives and metrics, that will guide the thinking machines as they do the detail planning work. And the more intelligent thinking machines become, the more strategic the job will become. With so much change, who will lead this, I wondered? George Fowler, of Spinnaker, does point out that this is where companies can turn to the tech services to engage in business-process modeling, and possibly outsource some of it. Of course, that gets right at the core of the issue—autonomous planning. As ToolsGroup’s Pat Smith points out, a huge percentage of the tasks can become/are rote. That is the place to begin, then, to “turn on” the autonomous engines. Today several major supply-chain-planning firms do have these types of services and it is an attractive and growing part of their business model. As to the talent gap issue, although baby boomers are retiring en masse, many grey-haired supply chain folks would like to stay in the game and work part time. Given the cloud services delivery models today, they could support managed services—advising, training, and establishing autopilot forecasts—without having to do the weekly plane commutes from client to client. That is a needed talent pool worth tapping, since their expertise is strong and they still have that passion and commitment to the profession. Outsourcing has become common for some physical processes such as manufacturing, transportation, distribution, and field service. Firms have also outsourced some knowledge-based processes such as design of components or entire systems (to ODMs) or market research. Yet it is striking (but not necessarily surprising) how few of the highest priority processes identified in our survey have been outsourced. These include S&OP, Forecasting, New Product Introduction, Pricing, and Strategic Sourcing. Many companies consider one or more of these to be their core processes. In our interviews, we asked if people would consider outsourcing these types of processes. The answer from many was a resounding “No!” A response from a mid-level manager at one of the top computer manufacturers summed up much of the sentiment: “That is our core value-add! Why would we outsource that?” When we asked senior executives, they were more receptive, and, in fact, discussed candidate functions that might be outsourced. Conclusions: Are We Ready for AI? It is exciting to contemplate the opportunities for AI. Yet, who is ready for these changes? A digital displacement psyche clearly exists, with some resistance and frustration with the large scale digitalization of information and the implication that has on our work, our lives (hence, the current revolt against some social networking practices). But Autonomous Supply Chain as a concept is so beguiling to busy executives who want better answers now, as well as to younger-minded, connected workers who are used to the “instant internet” of globally available information, that recalcitrant individuals may be brushed aside. This, of course, will cause organizational disruptions. We can take a page from a few industries where automation, AI, and the replacement of people by machines has become commonplace. Bank of America decided they had to prepare for AI. They now have training programs to reskill workers and prepare them for the future.24 Some of this is just training in basic banking skills so workers who find themselves in a shrinking department can qualify for an opening in another. But sometimes it is about mastering technology—which really is the key here, right? You don’t want to lose people after you invested in them, since the new organization will require people. The issue of what kind of people and how to attract them or train and keep them still looms large. Hence, one can re-imagine job descriptions and processes that include discovery and analytics as part of the workday. These types of job descriptions would go a long way in attracting young computer science or marketing grads into the profession. A Demand Scientist or Market Demand Analyst (as shown in Figures 2A and 2B) needs to understand the many demand streams and cross-functional information flows that are required to understand markets, customers, demand, and sources. In fact, some of these demand streams and data sources are pretty complex and tough to understand. Dedicating people to become experts in a particular area would also add interesting content to a job: in the fashion industry, have an expert on social sites; or in a perishables supply chain, the weather; in healthcare, expertise in tracking disease, travel, and weather patterns; or in coffee bars and restaurants, keeping track of events and crowds in particular areas to maintain appropriate levels of inventory and staff to serve peak demand. And so on. In the past, a category manager in a brick and mortar might be able to know the suppliers and products. But today, with 300,000 item locations, and infinite catalogues, it is beyond a human’s ability to understand all the potential products for sale, their demand, or even set pricing. Everything will be automated. When it comes to humans, history often repeats itself. Back in the nineties we had one of those inflection points—meet the challenge or slide into the abyss. There was a huge re-orienting across industries, especially in manufacturing as we began outsourcing. Lots of people were displaced. The point here is that we’re at another one of those inflection points as far as jobs—and society—goes. Last year had some big stories on downsizing from AT&T, Ford, GM, Eli Lilly, State Farm, many major banks, and of course, many, many retailers. But it seems those workers who have the relevant skills will be on safe ground economically, and those who don’t will be left behind. Debt-strapped nations will offer very little in terms of safety nets.27 These historical phenomena did occur many times in many economies, eventually creating new things. However, many individuals remained displaced and found no path to recovery. This has created a huge economic displacement issue and social/political dissatisfaction, which, in reality, politicians can’t fix. At the end of the day, we personally own that “bundle of value” and if we want a career in the future, we must diligently pursue all opportunities to acquire it. “The key question, then, for both individuals and employers facing these disruptions—and for governments and other stakeholders seeking to support them—is how to better anticipate and proactively manage the current realignments and transitions of the labour market to shape a future of work that expands economic growth and opportunities for all,” says, Autor. Clearly, we need a social dialogue that can move government, business, and academia, as well as increase personal awareness and accountability to prepare business and the individual for the changing world. For some interesting insights on AI read in the Wall Street Journal: The Impact of Artificial Intelligence on R&D and Innovation. Here, Irving Wladawsky-Berger talks about the evolution of computer technology and its automation of tasks and processes—from reducing business problems to mathematical processes, to one of invention. For a read of JDA’s moonshot to implement Autonomous Supply Chain read here. Cognitive Systems are not Machine Learning/AI systems, but may be used by AI. Segments that support cognitive systems include Natural Language Processors, Visual Systems, Speech Recognition, and so on. Unto themselves, each of these segments can be applied to a variety of applications. In combination, they make up a cognitive tool set such as Microsoft Cognitive Services, Watson/IBM, DeepMind/Google, etc. Here, also, is a list of startups featured in CIO Magazine: 20 Most Promising Cognitive Solution Providers-2017. These tools need to be applied to a specific business problem/function. For Supply Chain professionals, expect to see these embedded within your familiar brands of supply chain applications. These would provide relevant integration and search, use cases by role, etc. for users to build upon, so that enterprises don’t have to create and manage yet another set of tools in their already overburdening software stack.